A good memoir is a good mentor when you read as a writer. Time Was Soft There is a romp through literary escapades in one the world’s most famous bookstores, Shakespeare & Co., situated on Paris’s Left Bank. Canadian reporter Jeremy Mercer stumbled in one day, bought a book, and wound up living on the second floor of the store for eight months. Populated with people who live on the edge and on dreams, the store was rife with dirt, thievery, hunger, love affairs and the enormous good will of owner, George Whitman, eighty-six at the time. I met George when he was just eighty-two. I’d walked into the store on the advice of a friend. Used books were piled ceiling high everywhere. I spotted whom I assumed to be the owner because he looked aged and worn and I’d heard he had started this store half a century ago. He was sitting deathly still on a stool, his thin body tilted stiffly at an angle of about 15 degrees. His eyes were almost closed; his hoary hair was cobweb gray. He looked as if he was ready to breathe his last. I was afraid that if I spoke too quickly or too loudly that the force of my breath would blow him over. In slow speech, that would not offend nor harm the near dead, I began to ask him about a book I was looking for. Startled by this unexpectedly quick response from the near dead, I forgot which book it was I’d been asking about. “Oh! Do you have a book about love?” I don’t know where this came from. My heart paused; suddenly, I was wide awake. A few years later, one of my book-lover friends told me she’d read a memoir about Shakespeare & Co. for her book club. You can understand why I raced to my local bookstore and bought a copy. Time Was Soft There is an engaging memoir, filled with possibility. I couldn’t put it down. I like to ask myself what it is that makes for good writing so that I might incorporate some of those same techniques in my own writing. These are a few of Mercer’s www.jeremymercer.net literary skills I noticed in this book. 1. Continual mention of food—especially French food, cheeses, restaurants, and the cooking in the bookstore itself. 2. Much use of the five senses —doors banging open, cursing the cold. 3. Vivid quick descriptions of the many characters. 4. Simple dialogue moves the story along, and reveals more about the speaker. 5. Mercer lays bare his own emotions to us—a sweaty terror, an ego bruising. 6. Some history that gives the perspective of centuries. E.g., the bookstore is on a street that has been in continuous use since the year 400. Have I piqued your curiosity? If you read Time Was Soft There, I hope you enjoy it as much as I did. 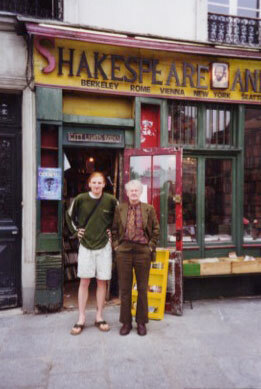 For more information on Mercer, see: www.jeremymercer.net Many thanks to Jeremy for sending me the above photo of himself and George Whitman in front of the Shakespeare & Co. bookstore. In his note to me, he said that he believes more than ever in the “power of personal stories”. Great blog post, Dee, and wonderful to see your smiling face!! Thanks, Kathy! I’m so pleased to see you here!